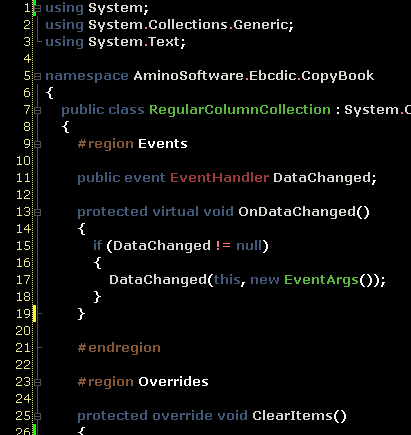 Scott just posted on using dark settings in Visual Studio thus prompting me to show off my settings and provide a link to my Fonts and Colors vssettings export file should anyone like it. I was one of the "default" guys until about a year ago a co- worker introduced me to the "dark-side". I like Scott's idea of bumping up the font size as well, but 15-points is simply too big. I have bumped up my Verdana (fixed-width is so legacy) from 8-point to 10-point and it makes a huge difference. My vssettings file contains only the Font and Colors settings as depicted in the screenshot and is posted here on the off chance that you like it as well.